One thing we really like about this hobby is discovering something new and unknown, be it small manufacturers with unique products, sports and performance cars, or creative and unusual engineering. 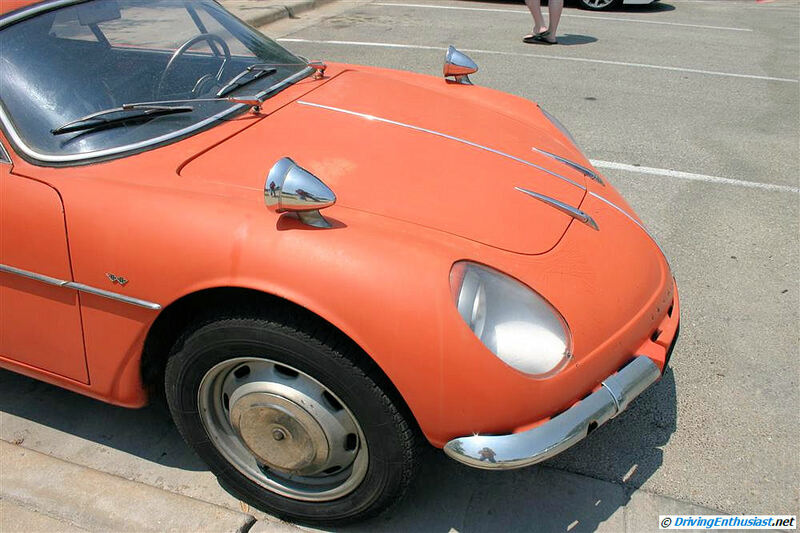 For a time, the French seemed to be able to combine all these attributes at once and the results ranged from fascinating to weird – sometimes all in the same car! 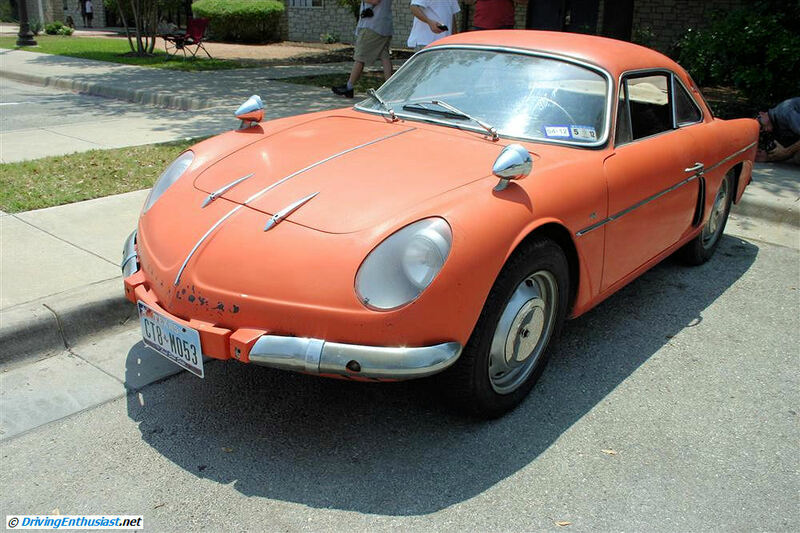 Hence our fascination with Renault Alpines (and their Willys Interlaghos cousin). We’ve encountered Alpines several times in the past 20 years, but seem the be spotting them more and more recently. Our favorite car museum, the Lane Museum in Nashville, is one good place to see two representative examples (and over 350 great examples of other rare and interesting cars). 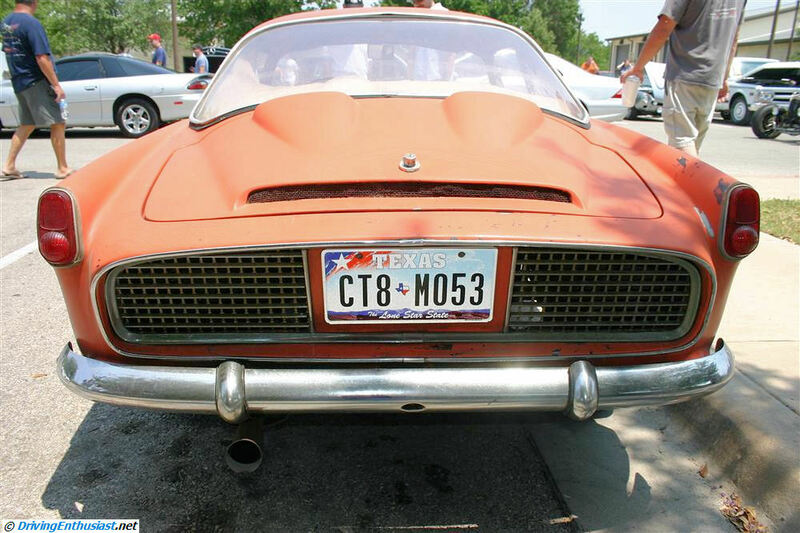 But we were especially surprised, pleasantly so, to find some examples right here in Austin Texas at our own Cars and Coffee show. 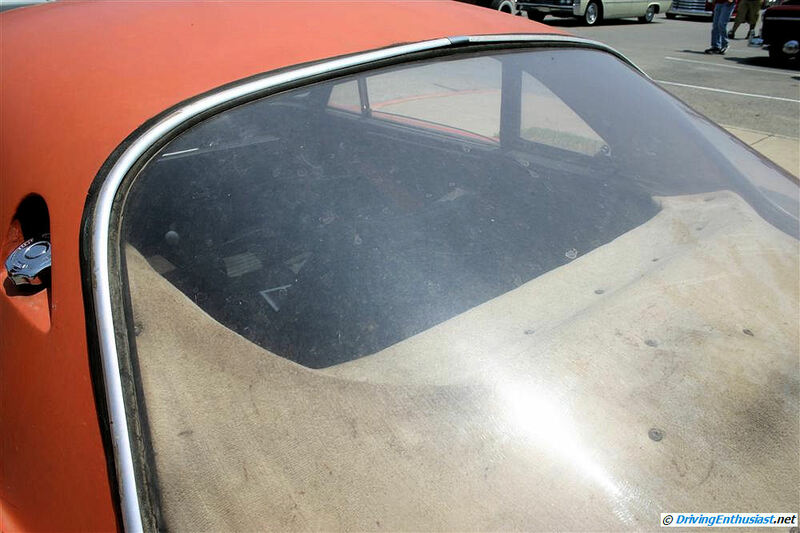 In the June 2011 show, it was a Willys Interlagos . Incredible – what are the odds of running into one of these? Certainly almost nil. The owner had brought it out to show for the first time, and it was to be sold the following week. It certainly pays to never miss a show! We have a High res (1000-pixel) gallery here, with regular resolution images and comments after the jump. See all of our Renault Alpine posts here. The Renault A108 was produced from 1958 to 1963. A cabriolet model was produced from 1960-1962. In 1961 a very brief production run of 2+2 models (with a more upright coupe-like roof line) were produced. The A108 uses a backbone design (a feature of all successive Alpines), with a cradle to support the body and another for the engine. Production is believed to be about 100 (some suggest it at as many as 236 – the higher number may reflect all of the open, coupe, and 2+2 variations that were built). 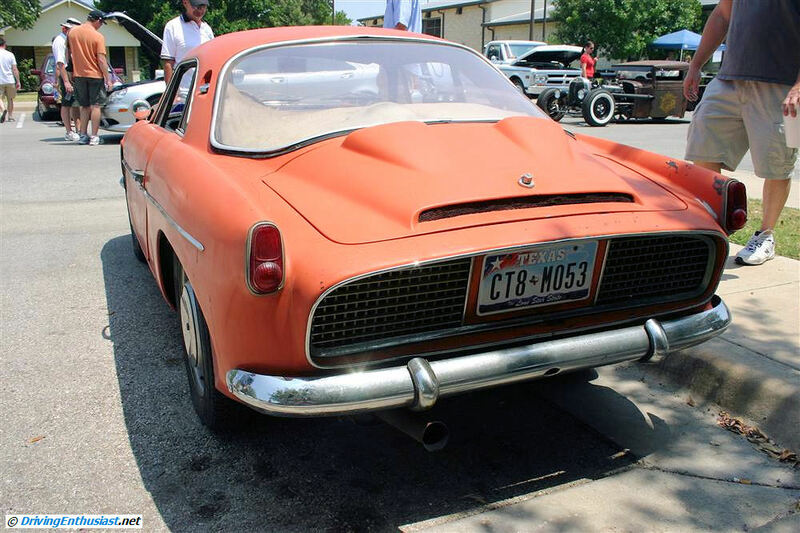 The fiberglass body allowed several small styling changes over the years of manufacture. The Willys Interlaghos is a rear-engine rear wheel drive sports car. 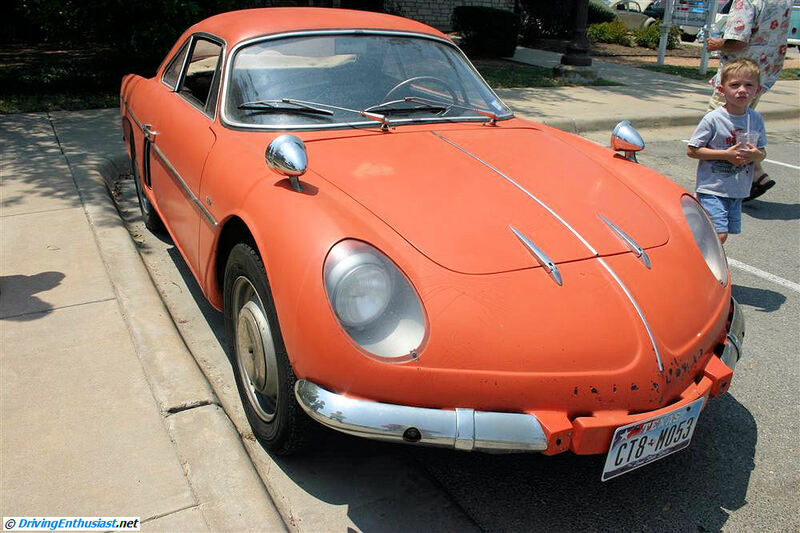 It’s French cousin from Renault has sometimes been called “the French Porsche 356” – which in 1958 wouldn’t be far off the mark. Except it was created later, and the styling is decidedly French and most definitely not German. Those are trunk hinges. Lettering is missing from above the license plate. The body design is recognized for it’s aerodynamics. The missing front letters above the license plate would read “Interlagos”, which you’d only know if you had otherwise identified this car. Air inlets for the rear engine. 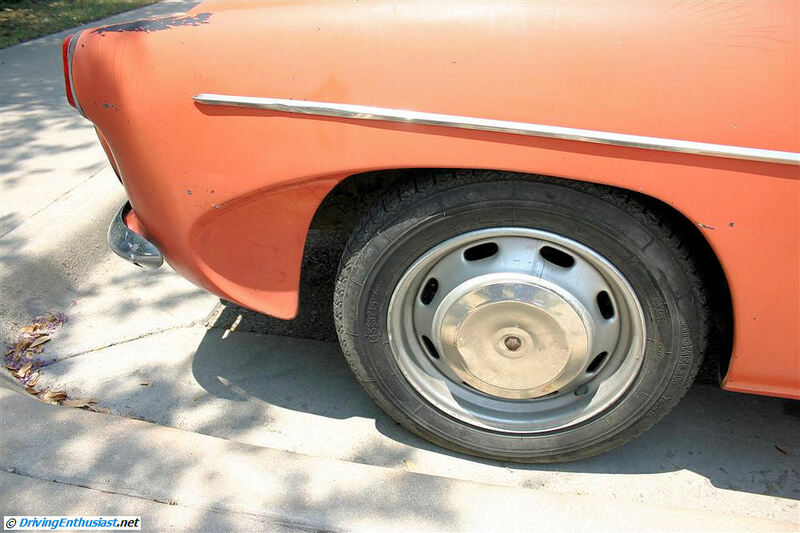 Unusual aerodynamic reverse scoop behind the rear wheels. 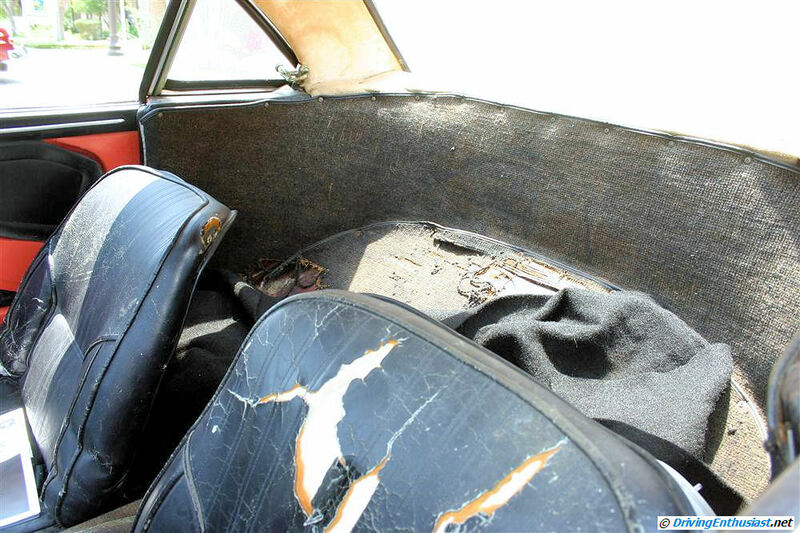 The rear of the car is a fastback design, following in the mold of it’s predecessor. Air intake and cooling vents predominate. The mesh on either side of the license plate open directly to the engine compartment. 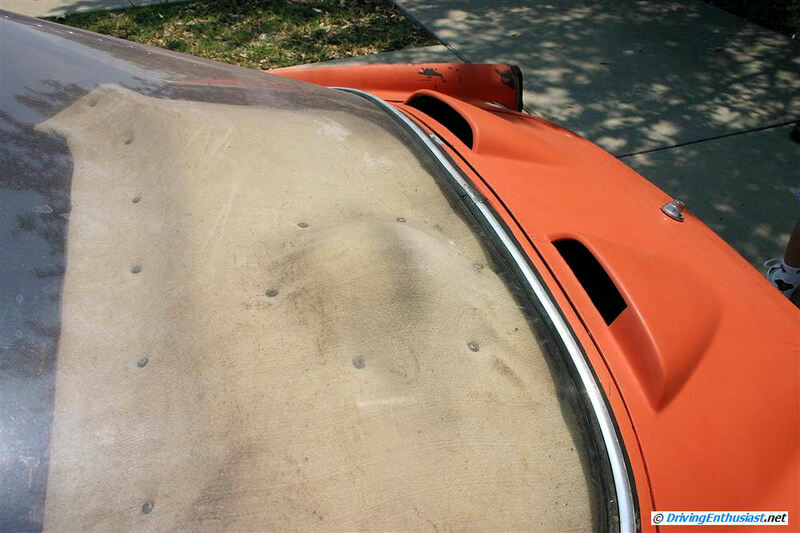 The long wide slit on the leading edge of the trunk lid may have been missing lettering. 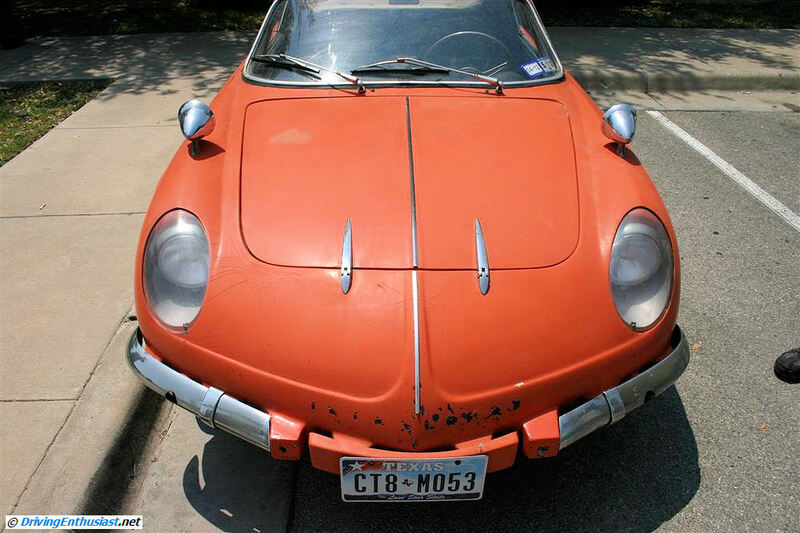 The owner challenged us to guess what this car was – and we lost. 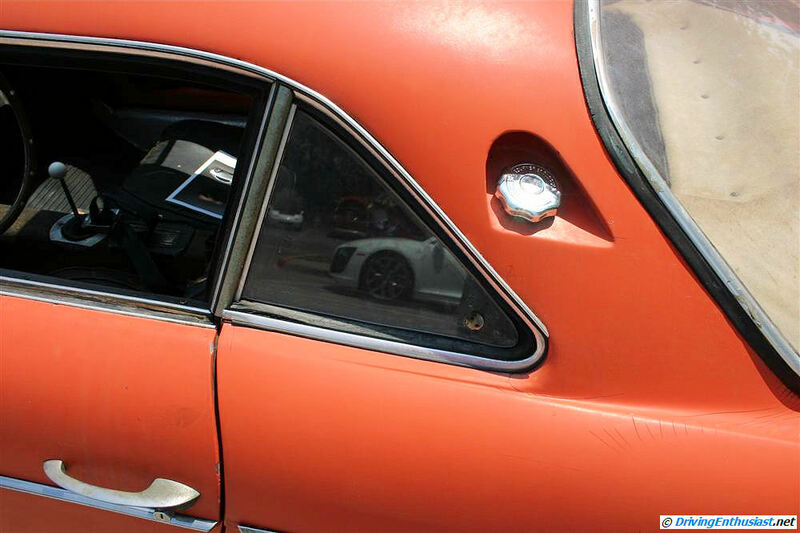 Dual air intakes (cooling and engine intake) at the base of the rear window. 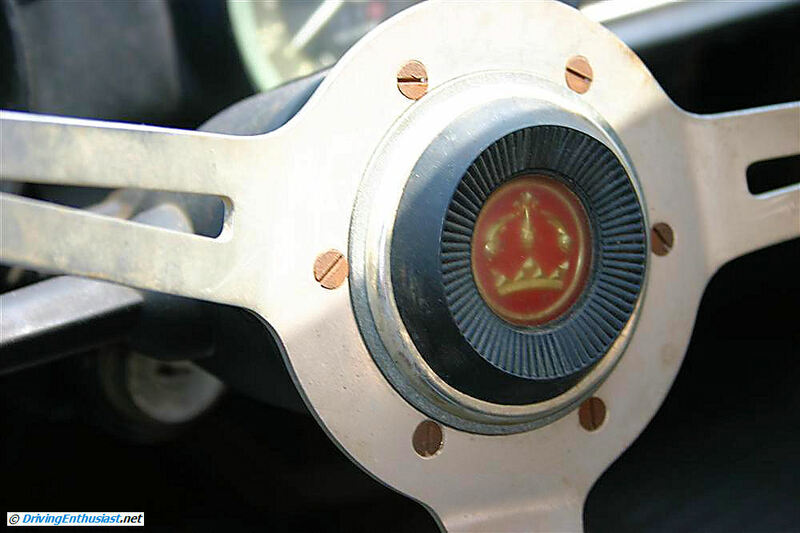 It’s the radiator cap… not the gas cap. The rear window wraps around. 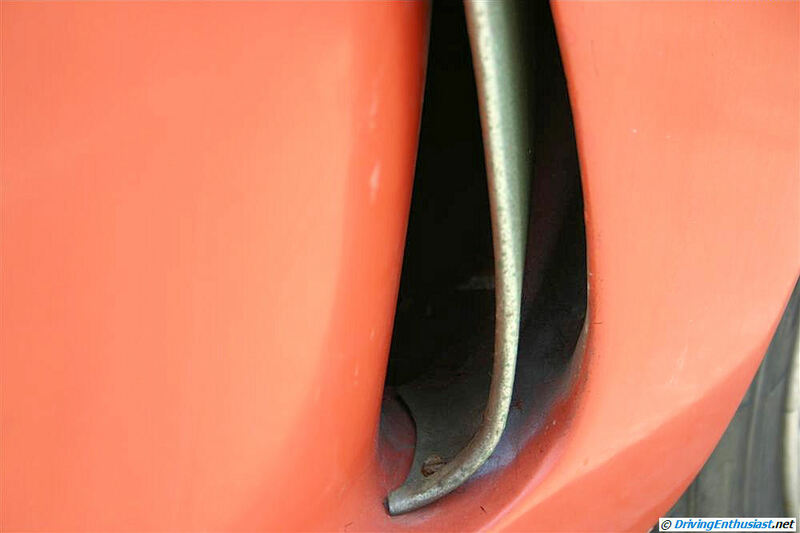 You can see that provision is made inside on the left for the radiator tubing. 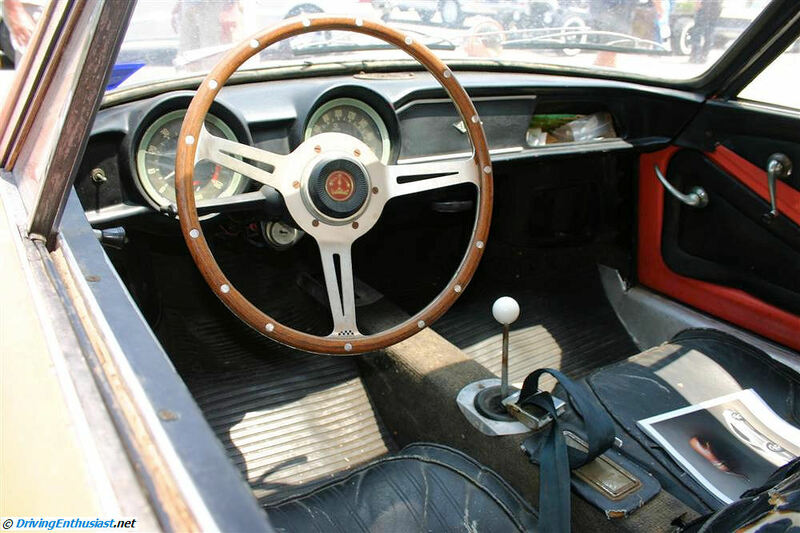 The interior is very sporty, with no pretenses made. The seating position looks to be ideal for this size of car. Steering wheel and badge detail. We didn’t see any script identifying the brand name. It was all missing on this example. 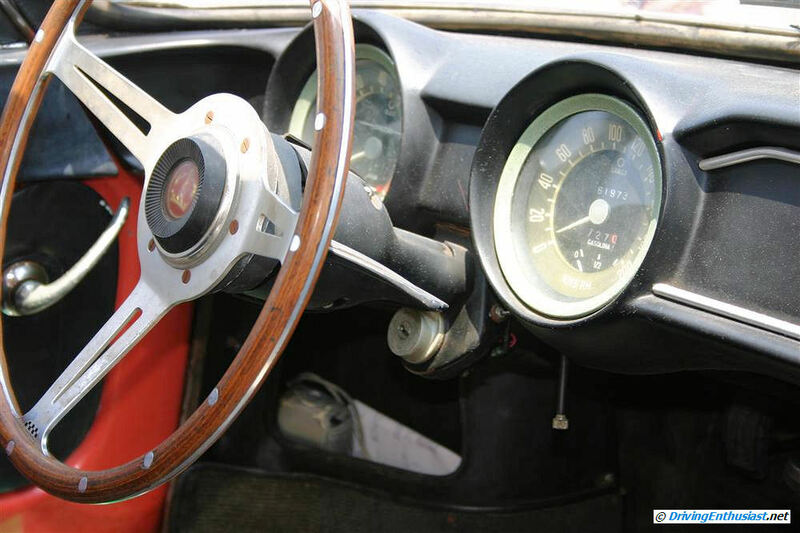 A large speedometer and tachometer are provided, with small gauges at the bottom for gas and temperature. Intriguingly, the instruments are lettered in Portuguese. 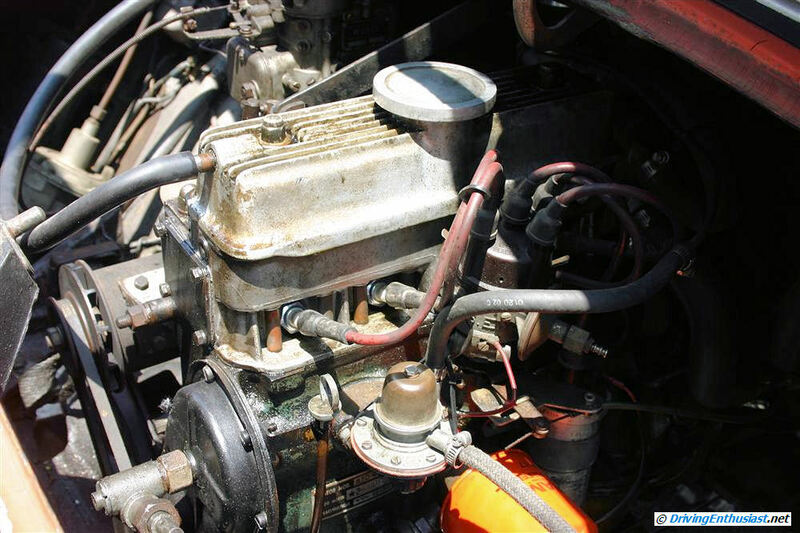 The production engine was either a .845 liter (37 HP), a .904 liter (53 HP), or a .998 liter (60 HP, 1 Weber twin carb) engine, depending on year of manufacture. This is an iron block and head non-crossflow overhead valve engine. Further reading: we have the following book in our library and it’s an excellent reference for all of the Alpines, from the A106 thru the GTA.